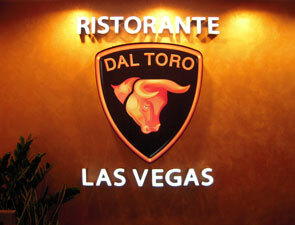 If you and your Vegas dining companion can’t decide on a place to eat -- maybe he wants to grab a burger and fries at the nearest sports book and you’d rather dine leisurely over some delectable Italian fare -- then Dal Toro is the place for you. The restaurant is part of Las Vegas’ newest Lamborghini enterprise: a one-of a kind, $30 million complex that includes the nation's 110th -- and Las Vegas’ first -- Lamborghini dealership, as well as a state-of-the-art car gallery, an espresso cafe and a retail boutique. Decorated glass walls separate the restaurant from the showroom and provide a salivating view of some of the world's most exclusive and expensive sports cars. The diner in you will appreciate that you can dine either indoors or outdoors. The consumer in you, meanwhile, will appreciate that you can either choose a table with a view of the cars, or one farther back in the restaurant, away from the temptation that they present. Other options include tables in the wine room or, if you're planning a private or corporate event, in the galleries upstairs and downstairs, which can be rented out for special occasions. Either way, you'll dine among modern-day masterpieces crafted by the likes of Lamborghini, Bugatti, Ferrari, McLaren and more. It's all up to you. 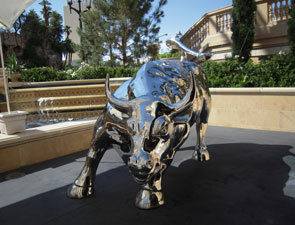 And if purchasing one just isn’t in the cards right now thanks to your poor performance at the Vegas tables, it's at least worth walking through in order to grab a quick bite before heading back to the casinos, invigorated and motivated with your next big purchase in mind. Dinner: 4 p.m. – 11 p.m.
Coffee Shop: 9 a.m. – 9 p.m.